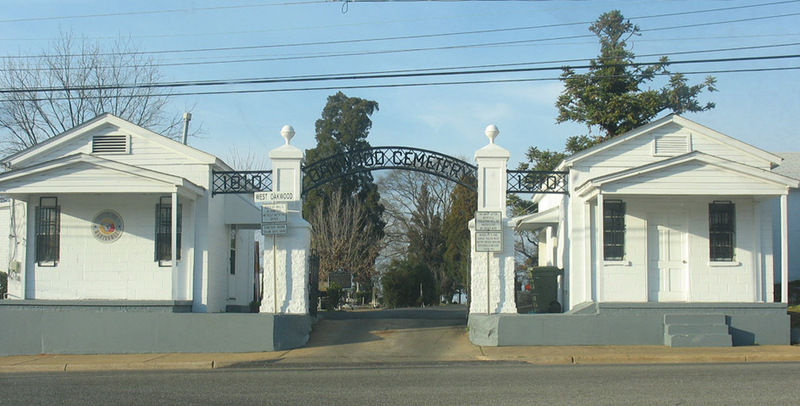 Entry to Oakwood Cemetery. Office on the left. 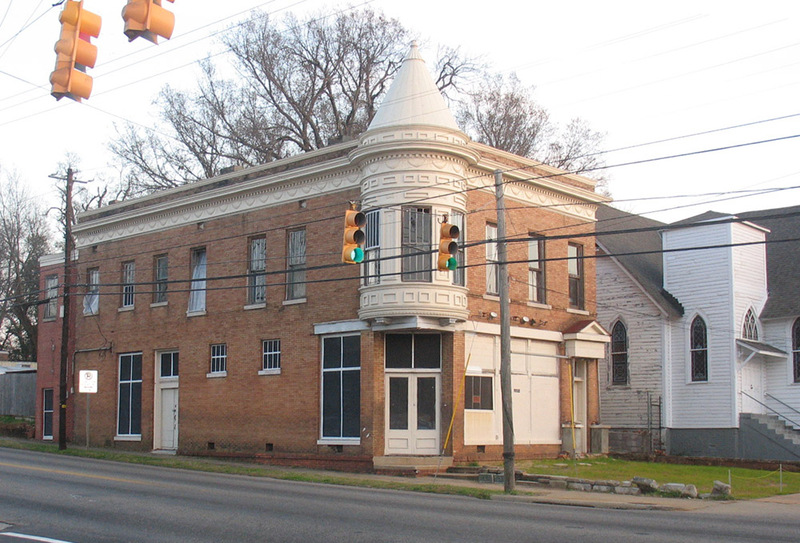 On Sunday, February 9, 2009 my daughter, Ife and I drove over to Montgomery, AL. It’s only a 2.5 hour drive from Atlanta. She had to pick up some art work and I wanted to see if the store my Grandmother Fannie managed before she married was still standing. 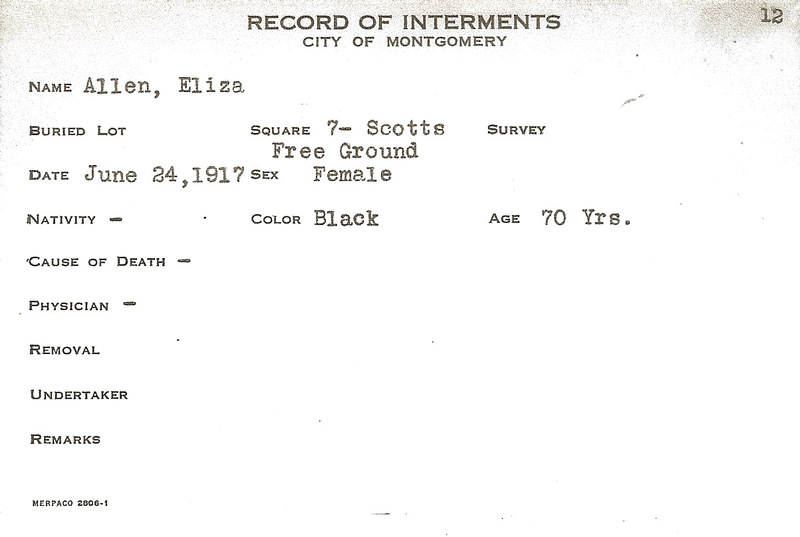 I also wanted to find Eliza and Dock Allen’s graves in Oakwood Cemetery. 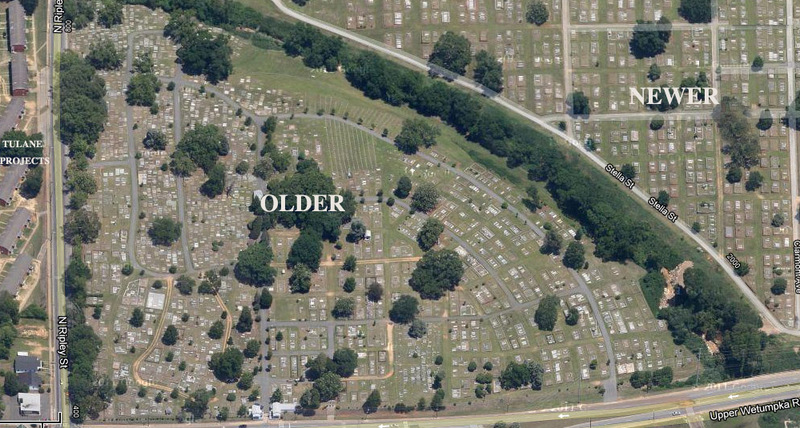 Oakwood Cemetery layout from Google Maps. The older section has Dock and Eliza’s graves. The Newer one holds the Tulanes. The Tulane housing projects, named after Victor Tulane, are across from the cemetery. First we picked up the art. The artist’s husband gave us directions to the cemetery and the store.We found the cemetery easily. It was open and there was a man walking into a little office near the entrance. 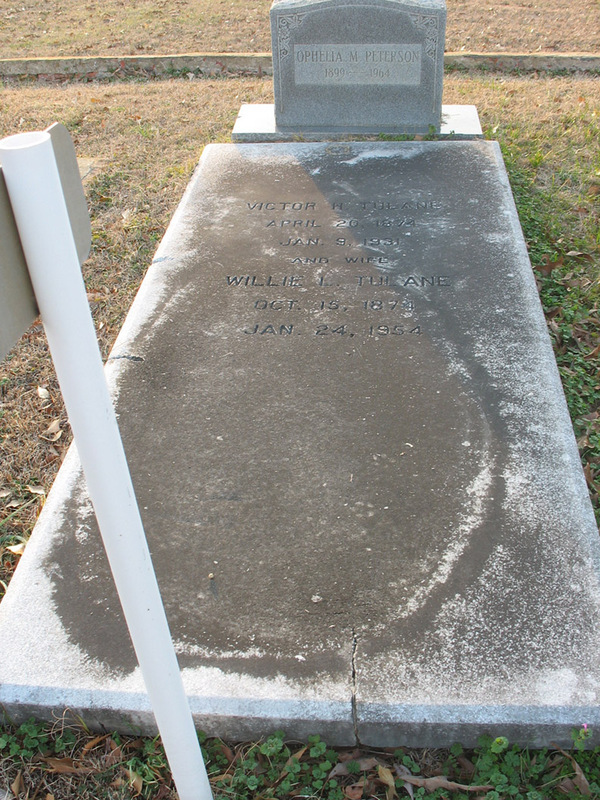 Ife parked and I went in and showed him the information I had, a location for the grave site of Victor Tulane. He told us to follow him to the place we could look. it was out of that one and around a few blocks and over the tracks to the newer part of the cemetery, which he drove up into, us following. He finally stopped and said it should be there in, that area, waving vaguely around. Ife and I got out and started looking. There were old graves, some newer ones from the 60’s and even 70’s and some from the 1800’s. we walked up and down hills and probably over graves and couldn’t find it. He came back with a map and asked if we’d looked further down. So we went in that direction. I told him I had some death certificates and asked if he could tell me where the graves were located if I gave him the names. He said I should bring them up to the office and he would copy them and look in the file. 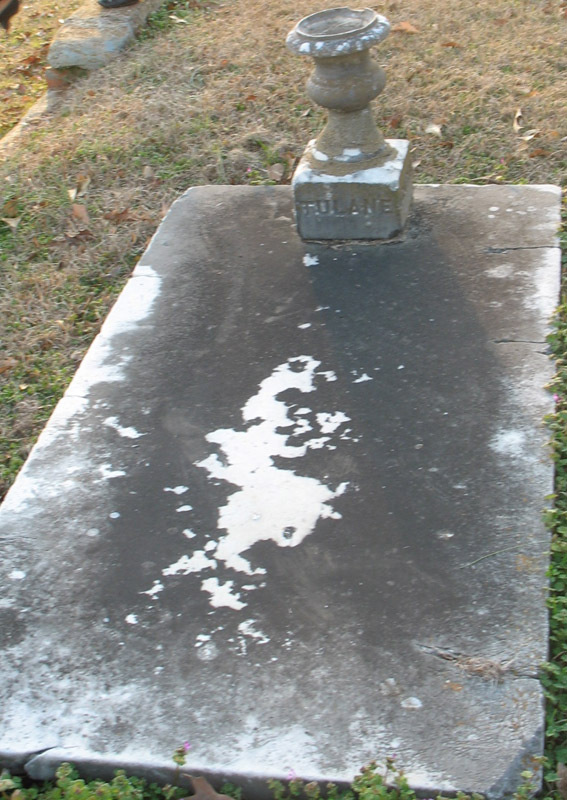 We continued to look and finally Ife saw this grave with the name we were looking for “Tulane”. It was a child’s grave. On the other side it said “Alean”. She looked next to it and there was the grave we had spent all that time looking for. We had walked by that place several times but there was an upright grave marker that said “Ophelia M. Peterson” so we just went by without looking at the flat, cement slab, which was the grave we were looking for. I still don’t know why Ophelia’s stone is right up above it or who she was. We then went up to the office and I took my death certificates in. He copied them and asked if he could copy Dock Allen’s photograph, which I had stuck in the mylar pocket with the death certificate. 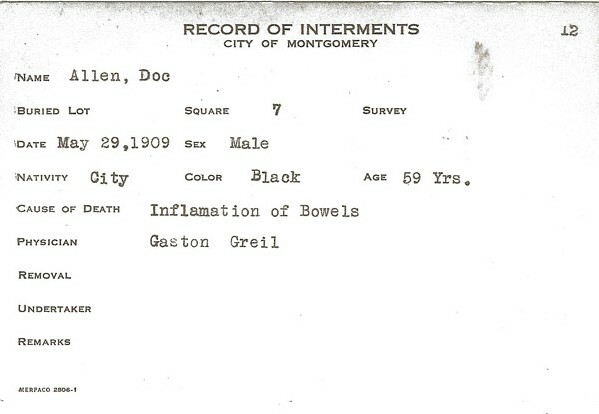 After making copies, he got out his file drawers and found Victor Tulane and two children, age 2 and 10 months. My mother used to talk about how spoiled their daughter Naomi was, but she never mentioned or maybe even knew that they had lost two babies. I think that might help explain the spoiling. He found Dock and Dock Allen (father and son) and Eliza. 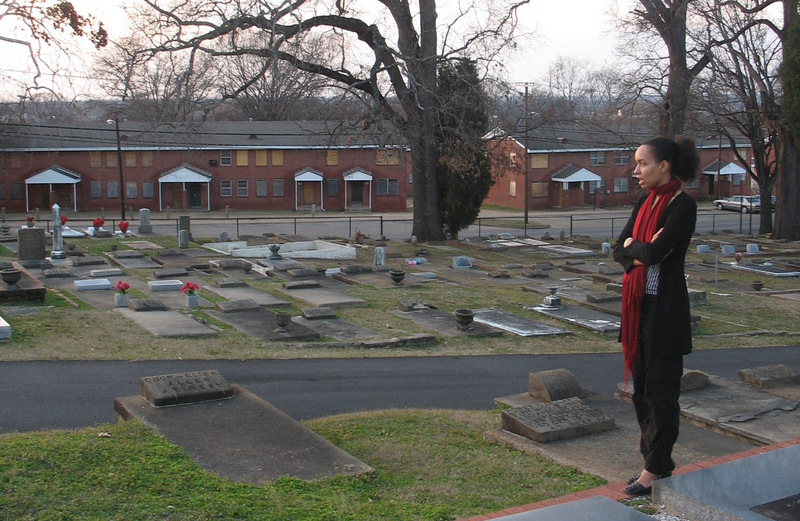 He said they were buried on that side in Scotts Free Burial Ground – when it started they let people bury for free. He drove ahead of us and showed us the section where the graves were and we walked around and finally found the grave marker for Dock and Eliza. We regretted not bringing flowers or something to leave but we hadn’t expected to even get in. Ife standing to the right of Dock and Eliza’s grave. Tulane Homes in the background. 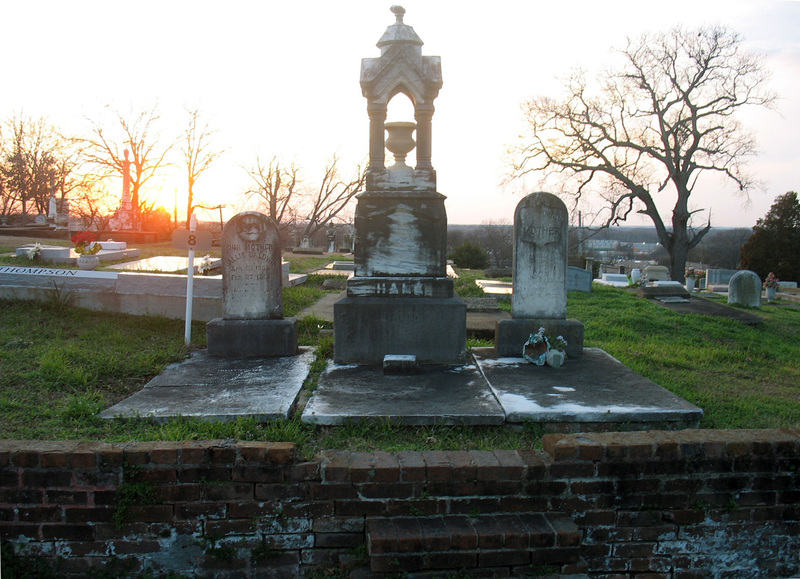 As we were leaving the Cemetery, wishing we had brought some flowers or an offering of some kind, I noticed a name out of the corner of my eye, “Sallie Baldwin.” It was like finding another relative. A cousin of a cousin and I spent weeks, months figuring out how our families connected and about her relatives. Her mother was alive then and kept giving us information that my friend didn’t believe but it always turned out to be true. 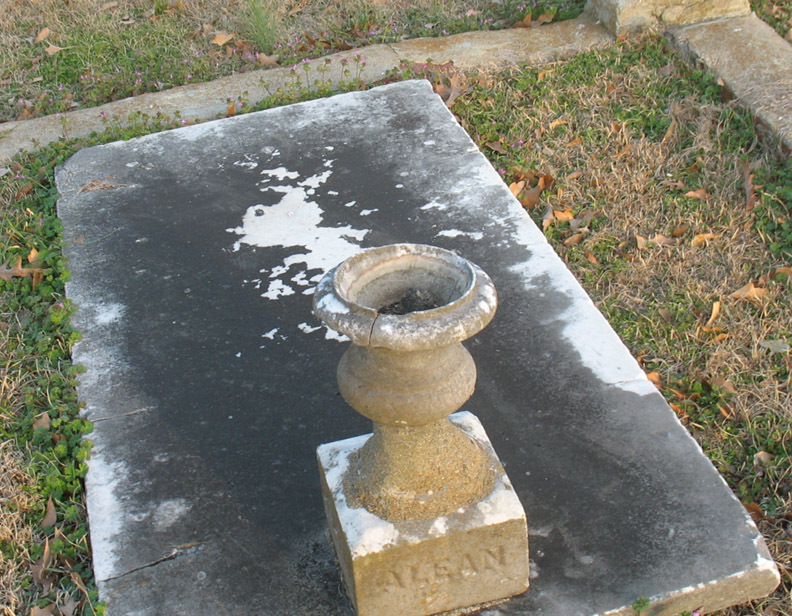 James Hale, a well known and well to do black Montgomery businessman contemporary with the Tulanes, was her son-in-law and is buried here also. When we left the cemetery we drove down Ripley Street towards the store. Ripley runs next to Oakwood Cemetery. The block where my grandmother and her family lived with Dock and Eliza Allen is now paved over for parking lots and government buildings. The store is still there and looking good. I feel that it’s time for another trip to Montgomery. The Tulane building in 2009. Excellent post! What a treasure to know where they are all laid to rest. I wouldn’t worry about the flowers. You have honored your ancestors well. I’m not worried really. I just felt like I should have brought something. Your difficulty locating the graves you were looking for reminded me of one time when I was looking for the grave site of my great-grandparents. I walked up and down every row in the cemetery, and I even asked a man mowing grass if he knew where the graves were. He told me that the the cemetery records were at the town hall. I drove into town and and they found the records. (This whole process took hours and hours.) I then drove back to the cemetery with the information I needed to find the graves–and discovered that they were located right by the passenger-side door of the car where I’d originally parked. I just had failed to look that close to the car for the graves sites. I was so annoyed with myself–though it was wonderful to have found the stones. It seems like we are looking so carefully but still missing what is right in front of us. Sounds like you had a productive day Kristin. Don’t you know that rule 101 of grave hunting is that your helper will always find the grave you’re looking for-at least that’s how it works in our house. Just send Ife off next time;-) Seriously though it’s great you found the graves and a bonus of the Sallie Baldwin grave too. Like you I usually get to the cemetery and think, oh should have bought flowers or a plant. The shop looks great too. I’m glad it wasn’t raining or hot or cold. Next time we will look at every stone, going in an ever widening circle from where we are. What an interesting post. You make me want to return to the graveyard I searched for some of my ancestors in a couple of years ago, and try again. Good Luck! They are there waiting for you. Didn’t you post pictures of the Tulane building previously? Not this one exactly, but a vintage one.